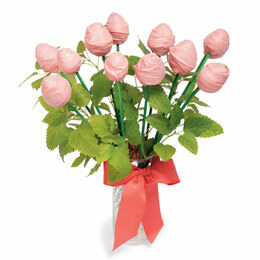 Make the perfect arrangement for that special person on your valentine list: a dozen candy-covered strawberry roses. For flower stems, use a cotton swab dipped in green food coloring to tint the wooden skewers. Let them dry (ours took about 2 hours). Stem the strawberries, then insert a skewer into each one. Heat the candy melts according to the package directions. Dip each strawberry into the melted candy, twirling it to coat it completely. Stand the skewers in a vase or tall glass and let the candy harden. Add fresh mint to resemble rose leaves, and keep the bouquet chilled until it’s time to give it to your sweetie.